Travis Sawchik’s piece at Fangraphs two weeks ago got to the heart of the issue plaguing the new era of neo-classical ballparks: a lack of intimacy. Sure, most of these parks reduced foul territory and improved sightlines to improve fan experience, which is wonderful as long as you’re sitting in the lower bowl or field level seats. In most newer parks there are 15-20,000 seats in foul territory from pole to pole. Above that lower level, anything’s possible. Legacy parks like Fenway and Wrigley took different approaches. Wrigley’s second deck was constructed fairly early in the park’s life. Fenway built more lower deck (grandstand) and small decks of premium seats above the lower level, plus the press box. In my eyes, Wrigley is the true classic two-deck ballpark, because it didn’t stray much from its pre-war design and character. Fenway is essentially a single-deck ballpark, at least as far as seating is concerned. Think of all new parks as a lower deck, and upper deck, and a three-story hotel or office building sandwiched between them. These days the difference between most ballparks is the approach to the second deck. The old cookie cutter stadia often had a mezzanine level with a level of suites underneath the traditional third deck. The Coliseum was built this way, as was Angels Stadium and many of the “octorads” out east. Several of early new parks followed this arrangement, including Camden Yards, AT&T Park, and Minute Maid Park. Newer parks differed by offering swanky club concourses, or additional suites behind the plate (or in football, along the sidelines). As more parks were developed, other cities chose to distinguish themselves with different features, sometimes favoring more suites over club seats. Think of all new parks as a lower deck, and upper deck, and a three-story hotel or office building sandwiched between them. The club seat area accounts for two stories, the upper suite level the third. The key disadvantage of this is that the upper deck is pushed skyward and its seats have to be steeply pitched or raked to better see the field. The worst example of this is the White Sox’ Guaranteed Rate Field, whose upper deck was so undesirable that the top eight rows were lopped off. The premium second deck was constituted as suite-club-suite, a stadium club sandwich. Progressive Field in Cleveland is not that much better, with its three-level wall of suites down the third base line and club seat deck along the first base line. We end up with several variants of the same theme. In nearly all of them the upper levels are pushed back from the lower seats for minimal cantilever and no columns. The older 60’s-70’s parks that received significant upgrades, Angel Stadium and Kauffman Stadium, took out the huge chuck of the lower seats behind the plate to accommodate four or five levels of suites, indoor clubs, and press. Other newer parks like Busch and Miller have their first suite level below the second deck club. Here the column is located at approximately row 30 of the lower deck. Another eight rows of seats are behind that column. This would bring the upper deck’s first row as close as row 17 of the lower deck, 10 rows closer than the Coliseum and 8 rows closer than AT&T Park. I don’t know how much of this has evolved in the last seven years, but it’s safe to say that it has to some extent. There’s no super-exclusive premium seating at the field level with its own concourse and a moat (though they could be introduced at some point). David Kaval has said that the A’s will use lessons learned from building and running the Earthquakes’ Avaya Stadium. He and the A’s have already been quite resourceful in using the limited available area at the Coliseum, so I expect changes that will turn this tide and make other owners jealous of the A’s ballpark’s intimacy. There are some that have advocated for something like Shibe Park or Tiger Stadium. While some aspects of those parks are admirable inspirations, they aren’t how we should build a ballpark in this era. Construction technology has improved, ballparks have been much larger out of necessity, and we want backdrops more than bandboxes. When those parks were built there was no thought given to families, casual fans, or corporations. If the A’s want to hit 3 million fans every year they’ll need those constituencies. Compromises will be made to find a proper balance between making hella skrilla and building a ballpark for the baseball purist. I have confidence that Kaval and team can do it. This entry was posted in Athletics, Baseball, Oakland, Owners. Bookmark the permalink. kaval has brought up fenway and wrigley as the two parks he’s going to want to imitate in his recent talks about the a’s new park down the road. i’ll continue to post it but pnc park in pit is the park the a’s should try to duplicate with their two deck design. not only does it fit the mode of the more intimate park feeling the a’s want in their new park but it’s probably the best designed of the newer parks built over the last decade or two. I’ve been to PNC and loved it. I moved around from the lower to upper to bleacher areas. While that is not a bad model, it actually isn’t as good as the AT&T model. 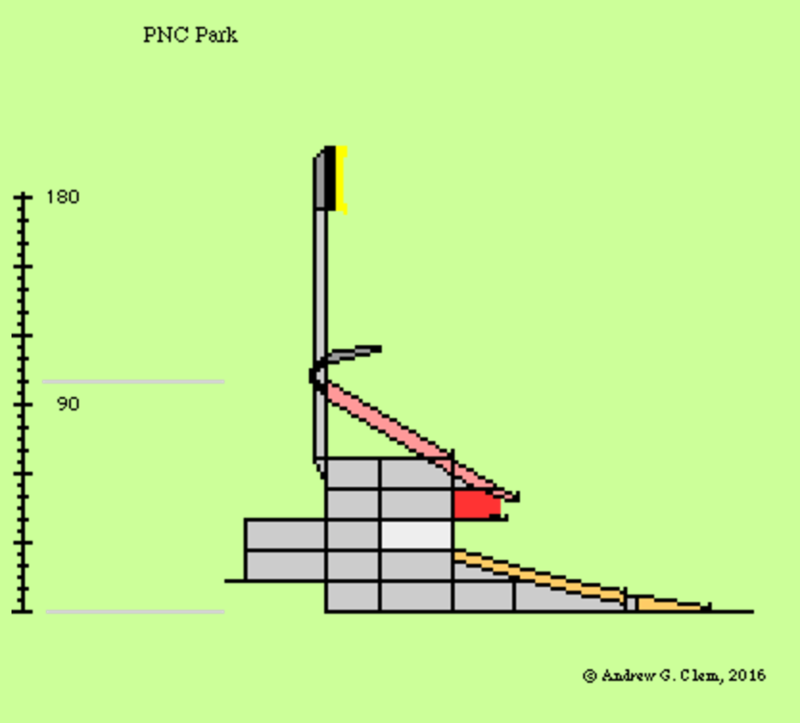 While it is technically only two decks, they both have lower, suite, club, and upper levels, with PNC combining the last two into one deck and AT&T splitting them around a suite level. By making the levels lower, suite, club, and upper level, the suites add verticality to the club level, which requires it to be steeper (or, alternatively, lessens the amount of rows that are under the overhang, which makes the club level further back). This in turn adds verticality and steepness to the upper level. By contrast, AT&T’s design makes it so that the club level can be closer (more overhang) or lower.